We accept high-quality guest posts from select experts. If you'd like to contribute in this fashion - check out our clear guidelines and submit your post here. B2B sales has been transformed by the application of many B2C Internet marketing techniques, but there are limits to the Internet where I think B2C can learn something from B2B. For example, with so many cool, self -service real estate websites like Zillow, Trulia, and Redfin available online, why is it that the vast majority of people still prefer to use local real estate brokers to buy and sell their homes? Why not just do it yourself? Buying a home is complicated. All real estate brokers are required to pass professional certifications, and good real estate brokers spend years honing their craft in the course of many transactions in their local markets. The Internet can serve up all the information you want, but it won’t make you an expert. Plus, buying a home is an emotional roller coaster ride. For the first time home buyer, it can be downright scary. You can get all the disclosures, appraisals, comps and inspections you desire online, but the Internet will not hold your hand and tell you everything will turn out OK in the end. This is the third post in a series that discusses the new breed of B2B buyer that has evolved in adaptation to the Internet and explores new rules of engagement that mirror those behaviors to maximize B2B sales and marketing effectiveness. The first two posts in this series explored customer self-service and B2B marketing. In this third and final post we turn our attention to B2B sales. A customer’s desire for sales engagement increases in direct proportion to purchase complexity. 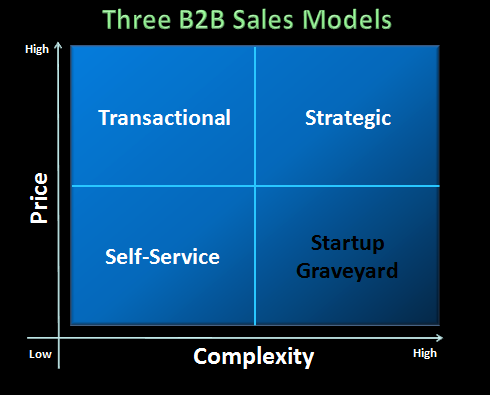 Thus, purchase complexity is a key element in identifying the right B2B sales model for your business. Simple purchases can be consummated with 100% customer self service, whereas more complex purchases require greater sales engagement as depicted in the image below adapted from the post Three SaaS Sales Models. Purchase complexity comes in two flavors: informational and emotional, both of which are clearly present in our earlier home buying example. Informational complexity arises when the buyer requires education to consummate the purchase. Emotional complexity arises when the purchase entails a personal risk to the buyer. When either or both of these purchase barriers becomes high enough, the buyer simply will not make the purchase without the aid of a salesperson. 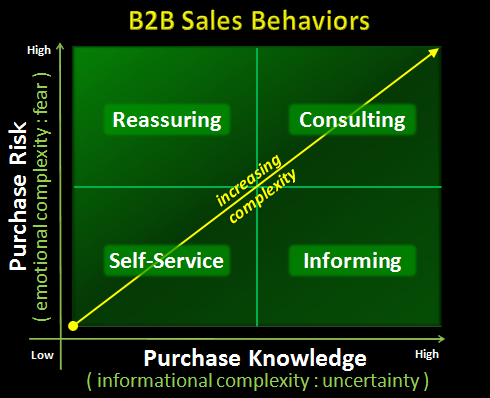 In response, successful B2B sales reps adopt sales behaviors that complement the buyer’s purchase behavior, offering expertise and trust in direct proportion to the respective amounts of uncertainty and fear felt by the buyer. the B2B buyer will look to the B2B sales rep to reduce the complexity. arising from the the respective informational and emotional needs of the buyer. The new breed of B2B buyer is online and impatient. When she engages with a B2B sales rep, she’s done her research, but is stuck and doesn’t want to waste the time figuring out how to get unstuck. She doesn’t get something about your website, your product, your pricing or your company, so she sends an email or makes a call to sales. She is well informed, but the purchase complexity has worn out her patience. The worst thing a B2B sales rep can do at this point is wear her patience even thinner. The new B2B buyer and B2B sales rep are engaged in an information arms race. Having followed the first two new rules engagement, you’ve published deep and wide and enabled efficient self-service. You’ve given in to the new breed of B2B buyer’s hunger for knowledge and speed, and in the process you’ve exacerbated the B2B sales rep’s challenge by eradicating the B2B sales rep’s information advantage. In fact, when the truly savvy B2B buyer knows more than your newbie B2B sales rep, you have a recipe for disaster. Today’s B2B sales rep must quickly assess the purchase knowledge and needs of the new B2B buyer and then lead, follow or get out of the way. Consultative selling is hardly new. What is new is that the B2B sales rep that fails to step up to the information arms race runs the risk of becoming at best irritating and at worst irrelevant. It is difficult, if not impossible for a sales rep to assess a buyer’s knowledge and needs if the buyer knows more than the rep about the purchase. There are few things more irritating to the new B2B buyer than having to listen to a script explaining something she already knows. Or worse, having to explain the product itself to the newbie B2B sales rep with insufficient training and experience. If there are inherent complexities to purchasing your product, then your B2B sales rep must master them. The B2B sales rep can’t win the B2B sales information arms race simply by memorizing the website content, because the new breed of B2B buyer is already there. If all your B2B sales reps does is usher buyers around your website and take orders, then you are either leaving money on the table or your website isn’t simple enough, because your business should be 100% self-service. The new breed of B2B buyer expects fast answers to questions she can’t answer for herself. Therefore, today’s B2B sales reps must be purchase experts that are skilled at consultative selling in order to adapt their expertise quickly and efficiently to the needs of the new B2B buyer. While the Internet has wrought dramatic adaptations in the new breed of B2B buyer, its influence is minuscule compared to the millions of years of evolution that have preceded it. In the end, the new breed of B2B buyer is still an emotional creature that despite great attempts to cover it up in the form of ROI analyses, vendor comparison matrices, technical evaluations and the like is often driven by fear. Fear of the unknown. Fear of public opinion. Fear of failure. What is portrayed as rational decision making and risk reduction is often better characterized as rationalization and CYA. There is no shame in this. This is who we are. We are not machines and it is critically important to us to feel good about the decisions we make. The savvy B2B sales rep understands this. Why is it that throughout history salespeople have had to deal with such bad raps? Because it’s assumed that they know things buyers don’t and the more they lie, the more money they make. Things have changed. This is the era of the new breed of B2B buyer. The stereotypical slick salesman is truly dead and the Internet killed him. Today’s B2B sales reps realize that open information and long term relationships require building trust, not breaking it. And while the marketing department can publish all the case studies, videotape all the customer testimonials, and get all the online recommendations it wants, when the stakes are high and the fear is real, there is no substitute for the B2B sales rep’s personal relationship with the buyer. Developing trust with the new breed of B2B buyer is not easy, because most communication is virtual and terse. Emails must be crafted with care and skill. While the pre-millenium B2B sales rep needed to be a smooth talker, today’s B2B sales rep must be a smooth writer as well. Moreover, today’s B2B sales rep must actively cultivate opportunities to expand and personalize the relationship with the new B2B buyer. Although the days of the traveling B2B sales rep are over for all but the most expensive purchases, it is essential not to fall into the trap of hiding behind email. When it comes to building rapport and trust, chat is better than email, phone is better than chat, video is better than phone and face-to-face it better than video. When your business depends on trust, you must provide the technologies and opportunities for your B2B sales reps to engage with your new B2B buyers at a personal level. Because sometimes, they just need someone to talk to. Note: I’d like to thank the Sales Leadership Council at ExecWorld for their conversations and contributions to this post. I believe many B2B professionals struggle in their adoption of social media for professional use, because they see it as a marketing platform as opposed to a professional networking tool. I frequently find myself thinking that the dumbest thing we Internet marketers ever did in social networking was to rename it social media. In the early days of Web 2.0, there was no such thing as social media. Today’s business buyers are awash in a deluge of online information. Virtually every business problem, process, product, and service, no matter how obscure, seems to have garnered at least one blog post or forum comment.